Art's Birthday January 19th 2019! This year there will be live performances by local Edmonton artist's. Audio/Video pieces by Artists local and abroad. An art gallery and sale. 50/50 Raffle ($5 a ticket). We invite you to a a night of musical studies! Call for sound art, electroacoustic, experimental music performances, and digital visual art pieces. It’s that time again Beamers! Art’s birthday is just around the corner. 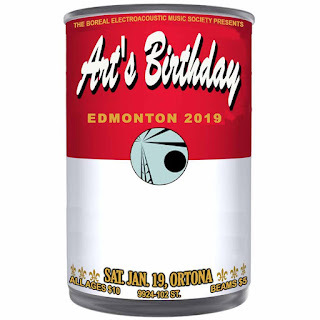 BEAMS (Boreal Electroacoustic Music Society) is looking for artists, both local and abroad, to take part in Edmonton’s celebration of Art! We will be celebrating on Saturday, January 19th, 2019 from 8pm until midnight at the Ortona Armoury. We are looking for artists to perform this night, along with digital artists to contribute to the projections that will be creatively mixed together over the course of the night. This year’s theme for Art’s Birthday is Diversity. We are looking for individual or group performances that will be 15 minutes long, and digital art that is either in jpeg or mov format. Still visual artworks or movie clips should be no more than 1 minute long. Another exciting dynamic for this year’s Art’s birthday (submissions depending) is that we would like to see if we can raise money for local artists and BEAMS by having an art sale! We are looking for artists who would like to hang works on the walls of the venue for the community to see and hopefully purchase. BEAMS would get a $5 donation for each sold work, which will go towards producing future BEAMS events. Please send a brief description of your performance/sound artwork, a short bio, number of performers, technical requirements and if possible provide a link to audio or video support materials by Friday, December 14th 2018. Please share this information with whoever you can. Let’s have a great celebration for 2019! 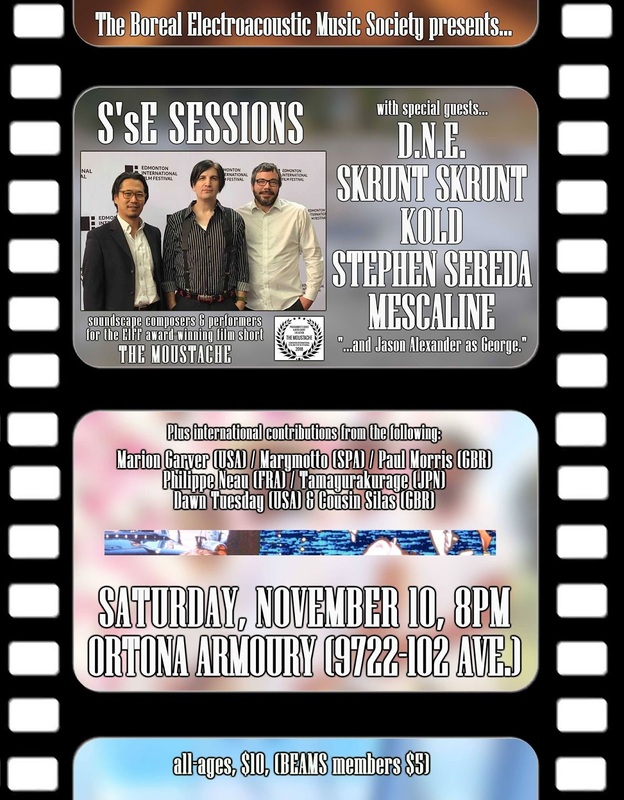 Edmonton-based experimental trio S’sE Sessions will make their first live appearance since being part of the award-winning film short The Moustache. The group, consisting of Trevor DePagie, Chris Samson and Hitoshi Sugiyama, contributed the soundtrack to the movie, which won Best Alberta Short (Live Action) at the Edmonton International Film Festival held earlier this fall. The event will also include international music videos by Marion Garver (USA), Marymotto (SPA), Paul Morris (GBR), Philippe Neau (FRA), Tamayurakurage (JPN), and Dawn Tuesday (USA) with Cousin Silas (GBR). 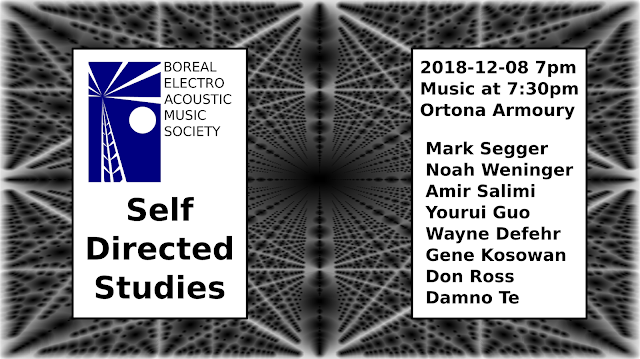 Presented in part by the Boreal Electroacoustic Music Society, the show is all-ages. Admission is $10 (BEAMS members $5) at the door. BEAMS at Nuit Blanche! Call for sound art, electroacoustic, or experimental music! BEAMS (Boreal Electroacoustic Music Society) will be presenting a 12 hour performance and sound extravaganza on September 29, 2018 from 7 pm to 7 am the next morning as part of Nuit Blanche Edmonton. We require art works and performances to present at this event! Works can be of any duration and can consist of live, fixed media, improvisations, interactive works, solo or ensemble, exploring new audience performer paradigms, machine-human interactions, sound poetry---your imagination is the limit. We also welcome proposals from curators who wish to put together a block of works over the evening. A nominal artist fee will be paid.